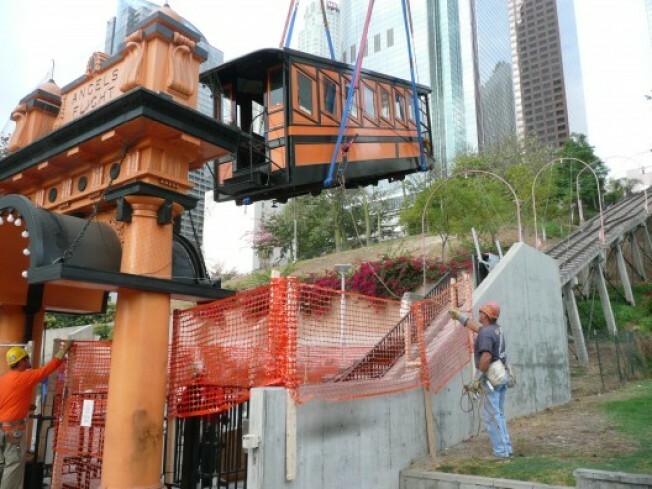 As part of that ongoing work at downtown's Angels Flight, Olivet and Sinai, a pair of orange and black railway cars, returned to the 107-year-old Bunker Hill funiclar railway on Saturday. Arriving via flatbed to Hill Street at around 8:30 am, Olivet (pictured above) was set on the rails by 9 a.m., while Sinai arrived in the afternoon and was up on the rails at about 4 p.m. (Both cars had most recently been stored at a MTA facility on Santa Fe Avenue.) Now in another phase of repairs, Angels Flight--closed since a fatal 2001 accident--will likely open to the public by the end of 2008 or early 2009, according to John Welborne, president of the Angels Flight Railways (he disputes the specific holiday timetable). And when it re-opens, Angels Flight will operate seven days a week, the cars running from 6:30 a.m-10 p.m. Evolving from its role as a more tourist-orientated attraction, the funicular will also serve to transport locals and visitors up and down the hill, believes Welborne. But given the economy, it'll be interesting to see how many downtowners will dole out a quarter--the cost of the ride--so they don't have to take the stairs. 1. Each trip takes 52 seconds. 2. The front end of Olivet and the back end of Sinai were both damaged in that 2001 accident that killed 83-year-old Leon Praport. 3. Initially, the ride cost a penny. A decade later, the price was raised to a nickel. 4. The original cars were originally painted white and were open-air, according to Welborne, who believes the cars got their orange and black décor in 1908. 5. The final settlement in the lawsuit over the accident came in fall 2006. 6. The restoration process raised $3.5 million in private and public donations. Donations came from everyone from the Omni Hotel to author Michael Connelly. 7. Next up for Angels Flights: Testing. The control system, the lights, and the gates are just some of the components that'll be tested. 8. The California Public Utilities, the state's rail regulator, must do a safety inspection of the railway before it can open. According to Welborne, a third-party engineer has been hired to do safety tests before the CPU does their testing. 9. In 1962, Angels Flight was designated as one of the city's first Historical-Cultural monuments (it was No 4.). 10.Here's a photo--dated 1999-of Angels Flight in action. Press release issued today: The following statement was issued today by Dennis R. Luna, Chairman of the Angels Flight Railway: We are pleased to report that Olivet and Sinai, the passenger cars that comprise Los Angeles' historic Angels Flight Railway, have been returned to their tracks. Saturday morning, a 275-ton crane filled the entire west half of Hill Street as, one by one, the two cars were lifted off flatbed trailers and gently swung over the nearly 100-year-old Arch at the Railway's lower station to be placed on their tracks. Angels Flight, a Los Angeles landmark that has been under renovation for the last seven years, is the shortest railway in the world. It provides public transportation up the steep hill between its lower station on Hill Street and California Plaza on Grand Avenue at the top of Bunker Hill for just 25 cents per ride. While there still are many weeks of fine-tuning and testing yet to be undertaken, we are hopeful that Angels Flight will reopen to the public late this year or early in 2009.